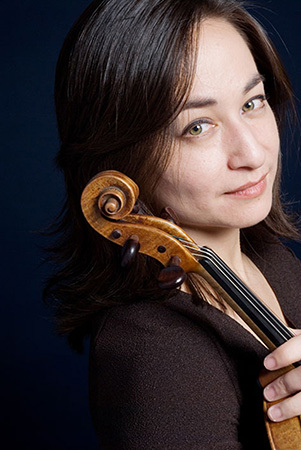 Ms. Resnick has had numerous works written for her and performs regularly in various chamber music groups, including the Blaeu string quartet, the Ruysdael string quartet, the Ensemble Modern (Frankfurt), the Context Ensemble (with Sergiu Luca) and the contemporary music group Möbius, currently Ensemble-in-Residence at Columbia University in New York City. She was featured on the “Young Artists Showcase” radio series on WQXR, New York, and has performed on radio and television broadcasts in Armenia, Austria, Bulgaria, the Czech Republic, France, Germany, Japan, the Netherlands, Russia, and throughout the United States. Ms. Resnick studied at the Curtis Institute of Music with Szymon Goldberg, the Juilliard School with Louise Behrend and Robert Mann, the Prague Mozart Academy with Sàndor Vègh, and the Mozarteum of Salzburg with Thomas Riebl and Ruggiero Ricci, and has worked closely with the composer György Kurtàg. She has been been regularly invited to the Marlboro Music Festival and the International Musicians Seminar in Prussia Cove, England. Ms. Resnick currently divides her time between the United States and Europe, where she is concertmaster of the Netherlands Radio Chamber Philharmonic and was Professor of Violin at the North Netherlands Conservatory. Ms. Resnick plays a Francesco Ruggieri violin made in Cremona in 1692. This violin was previously part of the Costa collection and was used by Zino Francescati.